Since May 2014, the Department of Accounting and Auditing has been using the GlavBukh accounting reference system in the educational process. It was provided to USUE on a non-commercial basis by the media group Aktion (Glavbukh magazine). Aktion, the largest in Russia company in the field of professional media, is the leader in the business media market. GlavBukh System joins the best qualities of professional periodicals and Internet resources. It considers to the smallest subtleties the need of all those who are connected with accounting, reports all the news that are important to know for accountants, improves the quality of education, and provides external electronic testing, which allows to better evaluate the results of mastering educational programs by students. Training video seminars of GlavBukh Systems add diversity to the learning process. Olga Krasnova, director of the BSS GlavBukh (Moscow), expressed her gratitude to the staff of the Department of Accounting and Auditing for fruitful cooperation in the project "Education Support Program on the basis of BSS GlavBukh System. 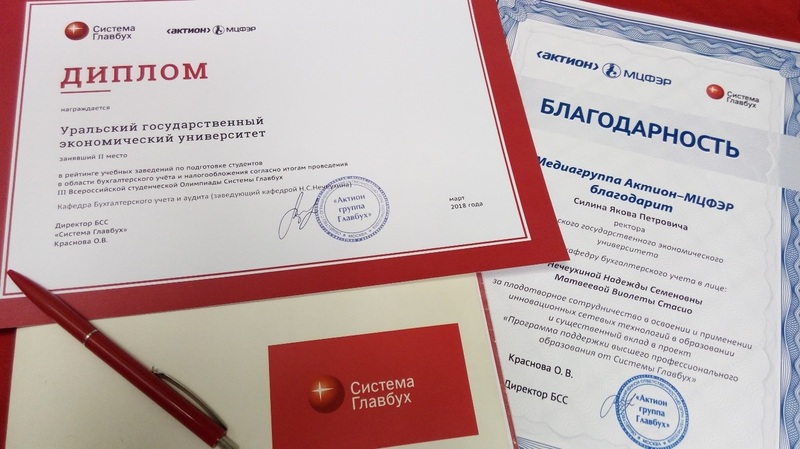 Students majoring in Accounting, Analysis, and Audit successfully pass the test on knowledge of GlavBukh System, participate in the All-Russia Olympiads on GlavBukh Systems, and show excellent testing results on the knowledge of the BSS GlavBukh.